This is a mod of TK's stock MiG-17F. The Pilot is a mod of one of Troopers Red_Pilots_Part1 pilots. The cockpit is taken from Zurawskis F-86. 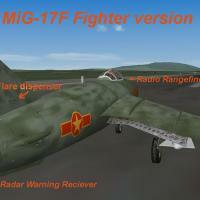 Thanks to all whos files i have used to make this MiG-17PF. TK's MiG-17F based more on the fighter bomber versions which the polish or east germans used in the late 70th and early 80th. In this mod i made the pure fighter version the soviets delivered to the Democratic Republic of Vietnam in the 60th. This version had no wiring for using air to ground weapons in their wings. So they were unable to drop bombs or fire missiles or use rocket pods. On the other hand the soviet delivered MiG-17F had a radio range finder, a radar warning reciever and a 5 shot flare dispenser in the right side of the tail fin. Later the vietnamese got chinese J-5A (MiG-17F copies) which had not such devices. IV. THIS MOD IS FREEWARE. COMMERCIAL USE IS NOT ALLOWED. V. For remarks, comments, bugs, etc please use CombatAce forum or send me a PM.